Yes, this blog is primarily a home design blog...but every once in a while I have to get my craft on, and then I have to share my creations with you!! When I saw this fabulous project in the February issue of Martha Stewart Living, I knew I was going to have to try my hand at it. Now, I personally adore the size and sparkle-overload of the brooches, as well as the pale pink ribbon (yum! 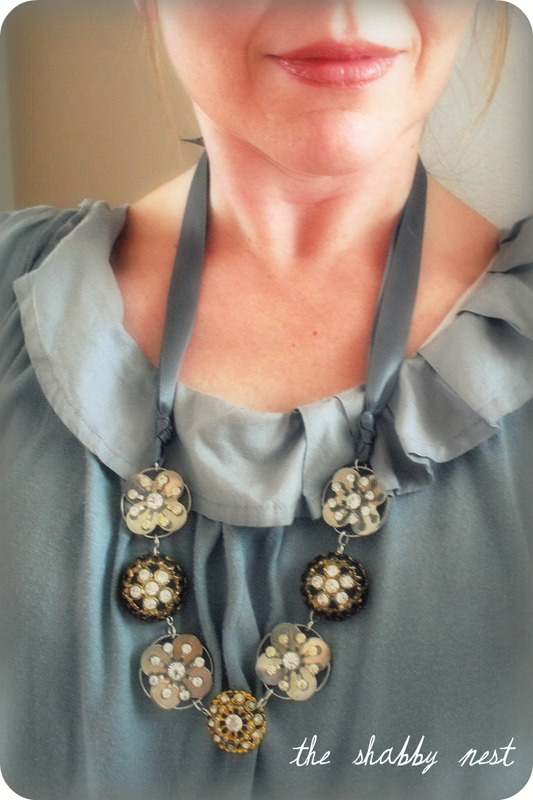 ), that MS Living used for their version of the necklace, but I aim to use what I have - or can get my hands on for free at my mom's house - so for my version I used buttons. Yep, buttons...sparkly, rhinestone-covered buttons. And grey ribbon...because I'm a grey girl. So, here is my interpretation. And since no one can give a tutorial like Martha...here's the link. OOH! I think I like yours better than the MS Living version : ) Nice job!!! That is beautiful!!! You have inspired me to try making one too! I love the choice of colors. I like yours better! Much more wearable. Are those buttons? You could have fooled me. Never saw such fab buttons before. Lucky you for having a mother who has those beauties in her stash. Yours is very pretty! I might try my hand at this - I have lots of old custom jewelry. I love the use of the ribbons. I like your version more! Very, very pretty. I prefer yours too! Looks fantastic. Fantastic job. Your neckelace is so pretty. I hope you will be waering it. WoW~! that's great!!! so pretty! ooooh...beautiful! i actually like yours better! and i want to go on a field trip to your mom's house! Love.Love.Love it! You have creative super powers! Stop! That is gorgeous, thank you for the inspiration! Your necklace looks beautiful! You could sell those, you know. love the buttons!looks like you paid a lot for it...I love recreating things cheaper. way to go! No slam to Martha, but I like yours more! How do you attach the jump ring to the button. Is there already a hole there? Could you please explain it. Thanks - btw I love your necklace. I like your's better. Good for you! Move over Martha! LOVE yours, way more wearable than MS's! Wendy, this is beautiful! So elegant. And I love the blue gray colors and the rich shade of the ribbon. Adore. What a great necklace! I'm going to have to look for some buttons! So cute! I like yours better too! I can't wait to try this...(also working on a version of your chalkboard idea). I am a grey girl too! When we built our house last year and used grey paint and gray carpet people thought we were crazy because it wasn't builder brown. I love grey! I loved this project too, when I saw it. I however, have not had time (plus procrastination :). Your necklace is just lovely and love the idea of buttons. There are alot of beautiful buttons out nowadays. Oh Wendy! That's just stunning!! Wendy, that is GORGEOUS, better than the MS version! I loove it when you "get your craft on!" I too fell in LOVE with this necklace. Your interpretation is much more practical and just as fantastic! Just beautiful and your top is gorgeous, I am a grey girl too!